WSN provides aerial mapping services for clients throughout the United States and Canada, and ranging as far south as the Virgin Islands. 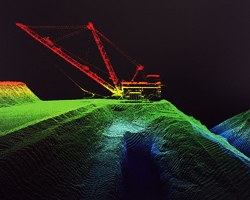 Our team specializes in LiDAR surveys, digital orthophotography, and photogrammetry services. We have the personnel, equipment, and expertise to provide fast response to your critical survey, photography, and mapping needs, regardless of where your project is located. Our photogrammetrists are certified by The American Society for Photogrammetry and Remote Sensing (ASPRS). Aerial LiDAR (Light Detection and Ranging) surveys use laser technology to survey large areas quickly and accurately. KBM GeoSpatial uses aerial LiDAR survey data to provide information such as terrain, roadways, transmission line corridors, buildings, signs, trees, and miscellaneous structures. This technology accurately captures large or hard to reach areas in a fraction of the time it would take for ground-based survey technologies. Digital orthophotography is more than an aerial photo. 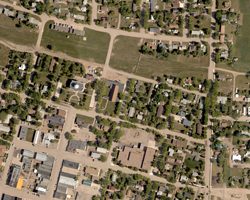 The KBM GeoSpatial team takes the aerial photo and connects its features to real world coordinates—georeferencing or rectifying the photo. The result is an aerial image, with distortions due to the camera lens or perspective removed, that includes references to known features and points. Our team uses LiDAR data to accurately rectify raw orthophoto images for a highly accurate basemap. 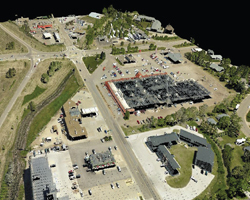 Aerial photogrammetry uses aerial images to triangulate vertical position. In simpler terms, photogrammetry works like your eyes—your eyes work together to gauge distance or depth. In photogrammetry, photos are taken from two lines of site and are then triangulated to produce a three-dimensional map of the subject area. The work is performed by Certified Photogrammetrists.